As our wedding day approaches at the end of June, I’ve been reminiscing about some of the firsts in the early days of our relationship. On our second date, Jorge brought me potted tulips, took me to an amazing off the beaten track restaurant called Le Quecumbar with live gypsy jazz and asked if I’d like to accompany him on a trip to Barcelona the following month. Because I am slightly crazy, spontaneous and love to travel, I didn’t hesitate to say yes. It was my first visit to the city. Jorge had lived there for three years and had a great group of really close friends in Barcelona (many of whom are coming to London for our wedding)! We stayed with Virginie for a few nights and then in the empty flat of another friend, Diana. Seeing any new place for the first time, is best through the eyes of a local, with their suggestions and guidance on how to best skip off the tourist trail. I’m hoping to plan another trip soon, so I thought it would be fun to pick the brains of a couple of the people we know who call (or have called) Barcelona home. 1. Kibuka. 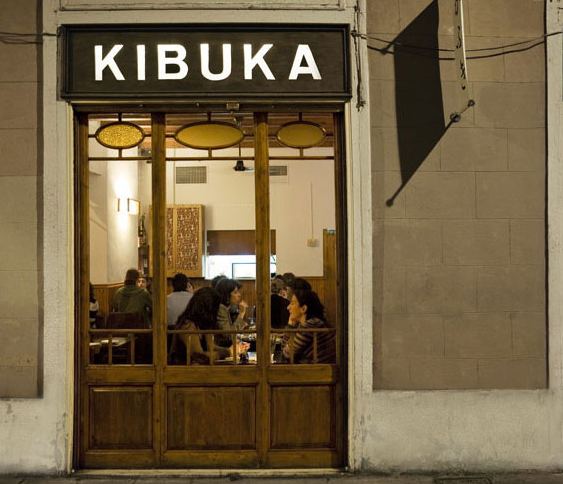 There’s something unforgettable about the minimalist Kibuka, a Japanese restaurant in Gracia that serves up some delicious (and artfully presented) fresh sushi. Though it’s all amazing, the best part, which I would go back to Barcelona for, is the dessert – mochi, to be specific. In Barcelona, dinner time is about 10pm, so beat the queues and head there around 8pm or 9pm instead. Jorge’s friends took us here on my first visit and it’s still one of my favourite sushi places. 2. Boo. With sleek black walls, a collection of deer heads on the wall and an old 1930’s phone box, Boo is a modern clothing shop with touches of vintage kitsch. Their name is inspired by Boo Radley, one of the main characters in “To Kill a Mockingbird”. Like Boo, the love to collect objects, hence the quirky decor. This is one of Jorge’s latest Barcelona favourites. Find them on Bonavista Street near Passeig de Gràcia. 3. Mushi Mushi. A shop owned by one of Jorge’s best French friends, Virginie, Mushi Mushi is also in Gràcia. She stocks different brands, pieces that she hand selects including some cool accessories and one of my favourite brands, Sessún. Virginie is one of the most stylish people I know and had plenty of suggestions for me last time I visited. I came away with a dress and skirt that I love. 4. 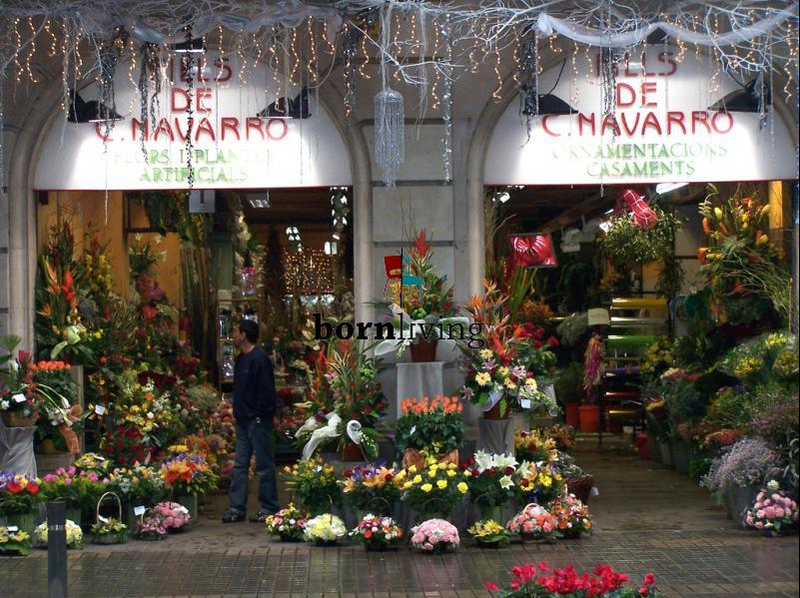 Floristería Navarro. Who would have thought there would be such thing as a 24 hour florist? You can find this one- one of Jorge’s recommendations from his time in Barcelona – in L’Eixample where the street outside the shop is always lined with herbs and flowers. Even if you’re just there on holiday, there’s something to be said about having fresh flowers around. It’s worth a wander around. The inside is beautiful (not to mention the smell) and it’s set in a huge space. 5. 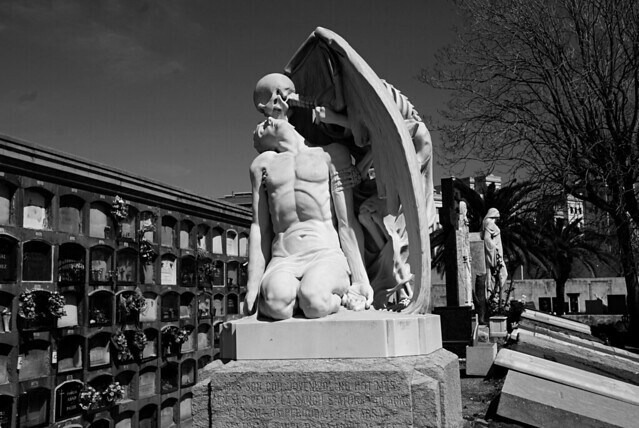 The cemeteries of Poble Nou and Montjuïc. Visiting a city’s cemeteries is always one of my favourite things to do when I travel. I love their peacefulness, the history, the photo opportunities. Debbie has been in Barcelona for 6.5 years and worked as a tour guide. She recommended Poble Nou’s cemetery by the sea with the famous El Beso de la Muerte (the Kiss of Death) sculpture and Cementiri del Sud-Oest, covering the southwest corner of Montjuïc – resting place of Joan Miró and a site where 4,000 victims of the Franco’s Civil War are buried. 6. Milk. Another one of Jorge’s close friends, Massimo, recommended Milk. He says it offers up the best brunch in town, cooking American style pancakes, eggs benedict and berry banana smoothies made from Greek yogurt. The cozy decor is pretty fantastic too. 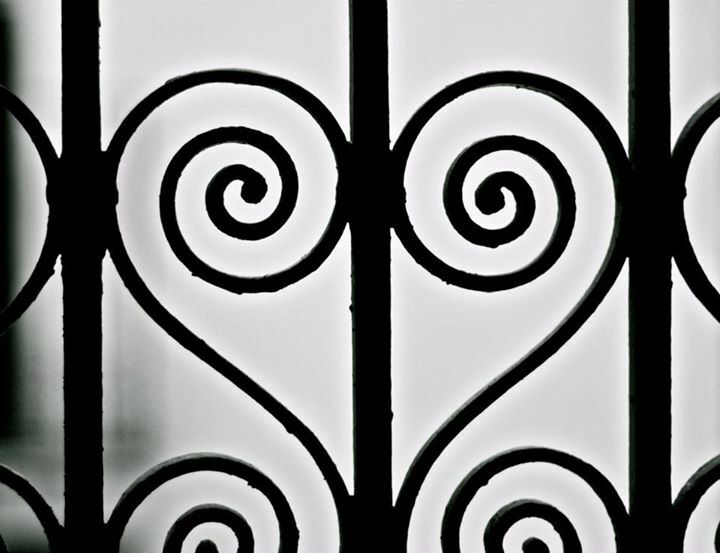 It’s run by an Irish couple and is located in Barri Gòtic. Go hungry; as you would expect, the breakfasts are huge. It’s also a cocktail bar. 7. Dostrece. For a taste of upscale nightlife, head to El Raval and pop into Dostrece – another recommendation from Massimo. It’s a restaurant by day (and one of the few places in Barcelona that serve up bagels for breakfast) that transforms into an ambient cocktail bar frequented by a stylish crowd at night. 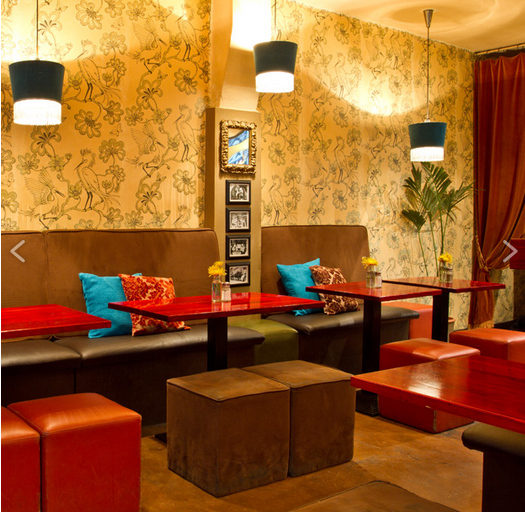 Downstairs, there’s a stage for live music, DJs and Morocan decor with crimson drapes and low ottomans that set the vibe. It’s run by a Californian. 8. Zim. Massimo’s last recommendation is Zim. It’s a teeny tiny hidden rustic wine bar on Calle Dagueria in the back streets of of Bari Gòtic stocking local Catalan labels and other hand-selected Spanish wines. A bonus: It’s run by Katherine McLaughlin of the famed cheese shop Formatgeria la Seu and what goes better with wine? You’ll be invited in with a warm welcome, laid back jazz and a few choice tapas. 9. Runner Bean Tours. Meant for tourists like most walking tours, Runner Bean Tours, a small family company, operate daily and are often joined by transplants and locals who are surprised how much they didn’t know about their own city. Jorge’s friend Debbie used to be one of the guides. Walking is one of my favourite ways to explore a new city. They even have a night time tour of El Born. 10. Stay like a local by renting an apartment. Not everyone is lucky enough to have friends to stay with in Barcelona, but you can definitely still experience that local living vibe. Rather than a bland hotel, check out the apartment rentals from specialist companies like local nomad. There’s plenty of central options as well, but this flat with a balcony overlooking the city from Tibidabo looks pretty stunning to me. Imagine a sunny week enjoying this view! Photo via Localnomad.com, the holiday apartment rental company in Barcelona. Check out some of the other apartments for rent in Barcelona here. If Barcelona is home for you, leave us some more of your favourites in a comment! How romantic and special:) I love stories like this. 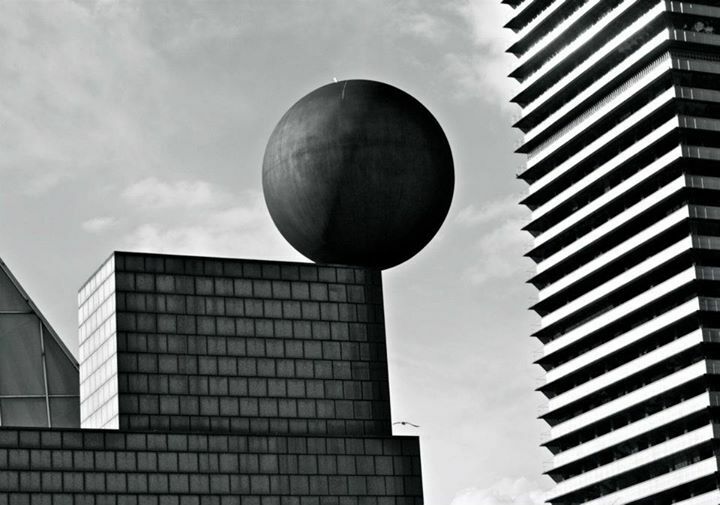 Btw: I so want to visit Barcelona. Balazs was there for work last year and he loved it. So hopefully we will go there sometime soon:) Have a beautiful day, darling. I love your spontaneity! Seriously who could resist a trip to Barcelona. That’s on my wishlist too!! Oh, you would love it. It’s a great city and I can’t wait to go back and explore new places I didn’t get to the last trip. I’m definitely in for a long weekend at some point this year! I have been to Spain, but never to Barcelona. I want to visit all the places in this post and fourth photo makes me want to paint one of the walls in my living room in a really dark colour!